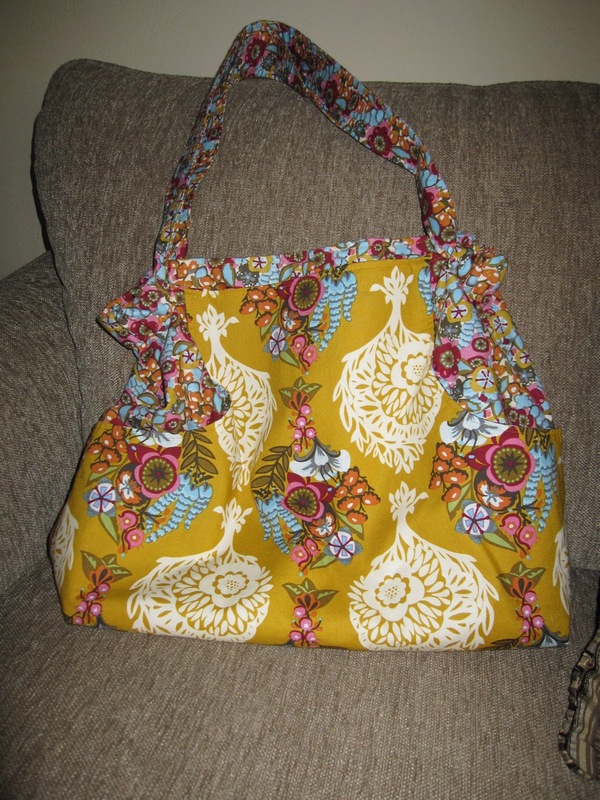 I have wanted to make the Multi-Tasker Tote from Anna Maria Horner for almost a year now. With Holiday gifts done, I was able to make some great headway just after Christmas and then finally finished the bag today. First thing I learned - this bag is BIG! I have to learn to look at finished measurements to get an idea of how big what I am intending to make really is. This sounds dumb but I have no idea if I will actually use this bag as I hardly carry anything around. Cell phone, sunglasses, wallet and a pen - that is all I carry in my purse. Cutting this pattern in half would have worked better for me, but I do love the bag. I used Anna Maria Horner's new Innocent Crush fabric for both the exterior and interior fabrics and they were (of course) lovely to work with. I enjoyed working with the pattern (first time use of a AMH pattern) and found it relatively easy to understand - I stopped a few times and had to read and read again to truly understand what was instructed. I am linking to Fabric Tuesday at QuiltStory for the first time to show off my first finish of 2011! Beautiful! I have this pattern and have been wanting to make it for awhile now... good to know that it's big! It's adorable, but definitely big! =) I love your lining fabric a lot! Great job. Cute! I've made bags that I used for a month or 2, then gave them a place in the back of my closet. I also have a purse pattern that I've had for a few months now that I really need to sew up. Maybe I'll get it out soon too :-). Great bag, although I may also be having my head turned by the gorgeous fabric. I try to keep my purses small, too--but have occasion to lug a bunch of stuff and wouldn't mind a prettier way to do it. I may check out this pattern myself. BTW, like the new blog design! I like that bag alot!!! Super cute Thanks for linking to Quiltstory! They also make good bags for knitting projects!